I am finally jumping on the blogging bandwagon and what a great way to start. 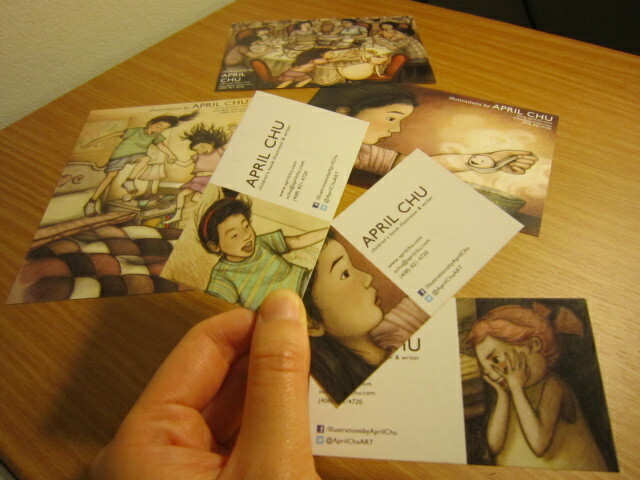 I just received my postcards and business cards from the print shop...and they look great! Woohoo!! I feel so official after working tirelessly for several months at my desk and in front of my computer. I even have hand cramps and blood shot eyes to prove it. Haha! But as of today, I finally feel like a legitimate artist. And they arrived just in time for the SCBWI CA North/Cental's First Illustrators' Day tomorrow, which I am super excited to attend. I can't wait to meet my fellow children's book illustrators/authors. It should be a blast! I would also like to give a special shout out to Dr. Mira Reisberg who has been a wonderful, creative, and nurturing mentor, teacher, and friend. She has helped me a great deal on my journey. I recommend her to anyone who aspires to be an children's book illustrator or author. She offers many great online courses as well as one on one consultations. Check out her blog and website. Cheers!